Area X has been cut off from the rest of the continent for decades. Nature has reclaimed the last vestiges of human civilization. The first expedition returned with reports of a pristine, Edenic landscape; all the members of the second expedition committed suicide; the third expedition died in a hail of gunfire as its members turned on one another; the members of the eleventh expedition returned as shadows of their former selves, and within months of their return, all had died of aggressive cancer. This is the twelfth expedition. Their group is made up of four women: an anthropologist; a surveyor; a psychologist, the de facto leader; and our narrator, a biologist. Their mission is to map the terrain and collect specimens; to record all their observations, scientific and otherwise, of their surroundings and of one another; and, above all, to avoid being contaminated by Area X itself. They arrive expecting the unexpected, and Area X delivers—they discover a massive topographic anomaly and life forms that surpass understanding—but it’s the surprises that came across the border with them, and the secrets the expedition members are keeping from one another, that change everything. I picked this up from the library for Nick to give it a shot, and I ended up reading it in just a few days. 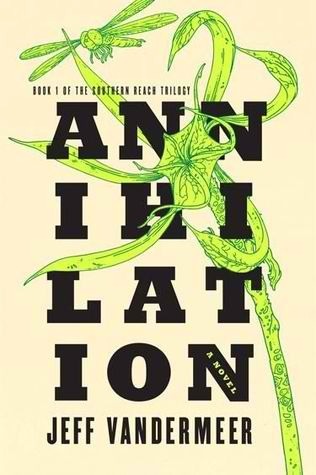 The futuristic Annihilation is a pretty slim volume—just under 200 pages—but VanderMeer manages to create a vivid, curious, and terrifying portrait of Area X. Was it a radioactive or nuclear disaster? Aliens? We don’t learn the reason for Area X being how it is, only that it’s screwing with everyone who goes there. Who’s trustworthy and who’s not? What is the purpose of their mission—is it really to collect biological samples and survey the land, or something else they’re not privy to? Annihilation is hard to exactly fit into a specific category. Sci-fi absolutely, but a weird sci-fi. Eerie fantasy could be in there a little too, horror, mystery, psychological thriller, dystopian fiction. I wouldn’t say the dialogue is profound, and the prose is super visually evocative, so I’ll say for this one that I’d be eager to see what a filmmaker could do with this story. It dragged in the middle for me just a bit, but the ending was super gripping and near impossible to put down until I finished. My imagination went wild with Annihilation—it is a mind-bending, enigmatic, and intense, especially at the end. It was really unsettling (in a good way). I am intrigued enough to continue the series! I hear the second book (out last month, and the final installment is released this November—brilliant move by the author and publishers to put out all three within 12 months, I think!) is very different from this first one. Read from May 17 to 22, 2014. This entry was posted in books and tagged dystopia, fiction, nature, psychological thriller, science fiction, speculative fiction, thriller by kristin @ my little heart melodies. Bookmark the permalink. I hope you do! I’m surprised I was able to get it at the library, there seems to be holds on it all the time. I bet you’d get through it pretty quickly 🙂 I’d be interested in reading your thoughts when you’re finished! I am so looking forward to this one, hearing so many great things about it! It is a real nail-biter! Looking forward to starting the second on at some point this summer 🙂 thanks for stopping by!